Whether you're smoking prime rib for a holiday feast or just because you deserve it, you'll find that it's not a difficult dish to prepare. And because it's usually served medium rare to medium, it doesn't require a lot of time in the smoker. One thing to know about prime rib is that even though it's called "prime rib", the meat isn't necessarily the prime grade of beef. A beef rib cut can be either select, choice or prime grade. 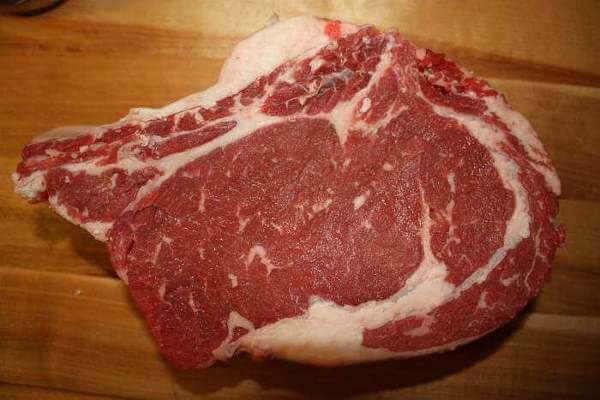 Prime is well marbled with fat, which makes it the most juicy, tender and flavorful grade. It's also highest in calories. Select grade has much less fat, and because of that is less tender and juicy, but still a good cut of meat when properly cooked. And with less fat, it's also lower in calories than the prime grade. The fat content of choice prime rib lies somewhere between that of the other two grades. 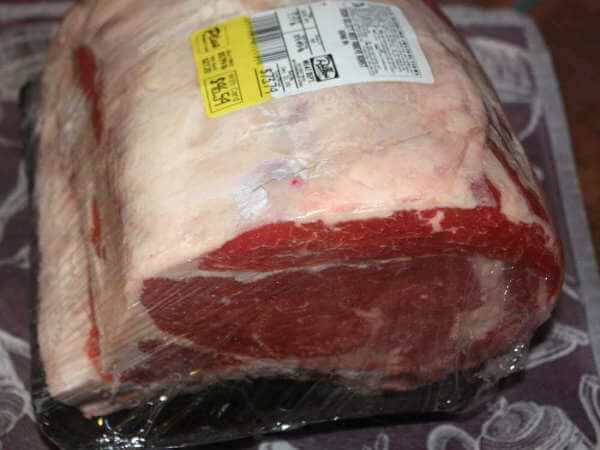 The rib rib roast shown here is a small two-bone section from the large end of a whole, select grade prime rib. Most of the fat is concentrated around the perimeter of the central loin muscle, with just a small amount of marbling. Fire up the smoker, and aim for maintaining a temperature of about 265 degrees Fahrenheit. At this temperature the prime rib will cook slowly enough that it will be evenly cooked from the outer surface to the center. It's also hot enough to slightly brown the exterior of the meat, which adds another great tasting layer of flavor. 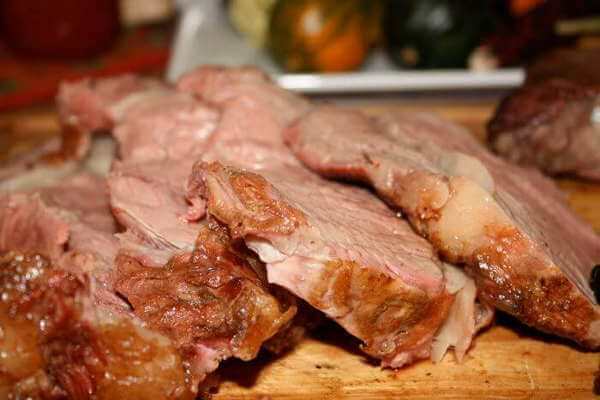 Place the rib roast bone side down on the grate, and cook for approximately 15-20 minutes per pound at 265 degrees. Use a light flavored wood so the taste of the beef isn't overpowered. Fruitwoods like apple and pear are good choices, and two, or maybe three additions (if you like it smoky) are plenty. If you can't find a mild wood to use, you can use a lesser amount of a more intensely flavored smoker wood. The internal temperature of meat continues to rise for 10 to 15 minutes after it's removed from the heat. 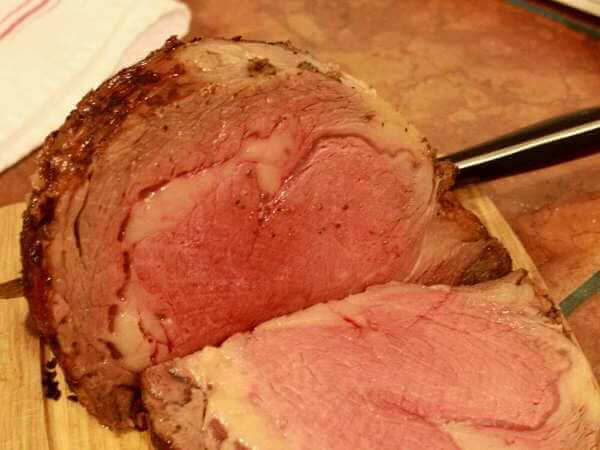 Use the following chart to guide you to cooking the perfect smoked prime rib. Remove the rib bones and cut the roast into half-inch thick slices. Serve with a salad, baked potatoes, and a variety of grilled veggies. Make sure there's crusty bread for soaking up the meat juices left in the bottom of the plate. One last thing, as the prime rib nears completion in the smoker, put together some horseradish sauce for dipping. It's easy to make. Simply combine 1/4 mayonnaise with 2 to 3 teaspoons of spicy horseradish and squeeze of lemon juice. Make the sauce at least 30 minutes beforehand so the flavors have time to meld together.